Fiona performed on Show 320 in Lubbock, TX, on February 27, 2016. Fiona Shea (violin), 16, is from Lubbock, Texas, where she is in eleventh grade in the homeschooling program out of Texas Tech University Independent School District. She studies with John Gilbert at Texas Tech University School of Music, and has performed with youth ensembles in the Lubbock area. 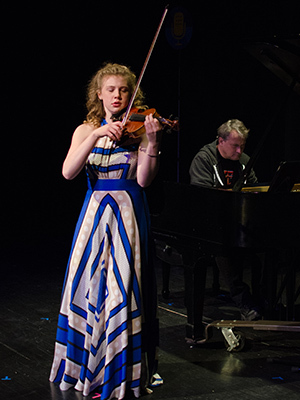 She has also participated in and won numerous competitions and festivals throughout the rest of the country, such as the Interlochen Center for the Arts Summer Music Program Intermediate Division Concerto Competition, the Schmidbauer Competition, and more. Outside of music, Fiona enjoys cleaning and organizing, playing Frisbee, and hiking.